It’s been a crazy journey since that initial launch and we’ve made a ton of progress towards all of these goals. We’ve made great strides on the community side. Trifacta now has over 75,000 users interacting with our software in some shape or form, whether directly or through partnerships. Wrangler has been made part of the curriculum of analytics and data science classes at academic institutions such as Columbia and ESADE Business School. The wrangler community has also exposed us to a variety of new use cases. Many, like the one from Tipping Point shown in the video below, are for the public good. We’ve also invested heavily in supporting our Wrangler users by introducing a community portal with online training & certification, FAQs, video tutorials and much more. “Data preparation” seems to be everywhere now. Analyst firms like Forrester, Ovum, Dresner and Gartner have all published research recognizing data preparation as a standalone software category and evaluating each of the vendors within it. Within technology and business, data prep is popping up more and more. Whether it’s another vendor entering the data preparation category with newly developed data prep features or stories in the media of how businesses are benefiting from more efficient data preparation. 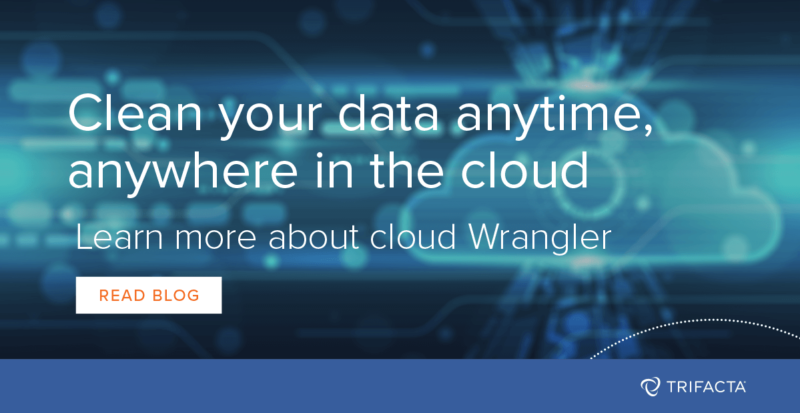 Building on what we’ve learned from our users over the last two years we’re excited to share the release of an entirely new version of Wrangler, now available as a free cloud service. We’ve transitioned the architecture of Wrangler from a hybrid desktop application to a completely cloud-based service. This transition to the cloud means that you never have to download any software and lets us push new features out at a much faster pace. We take the responsibility of hosting your data seriously and all data uploaded is encrypted in transit and at rest. In addition to the change in architecture, the new version includes many new features that aim to make using Wrangler even more intuitive and efficient. We’ve provided a summary of these new features below. An FAQ on the new release of Wrangler is available on the Trifacta Community portal here. We’d love to hear about your experience with the new version of Wrangler on our community.